Lose That Girl: RATE IT! 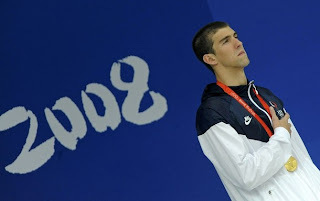 Michael Phelps - Diet of Champions! No matter how diligently I try, it's virtually impossible to avoid the Olympics. The Summer Games just don't float my boat but it takes a heartless soul to ignore the superhuman achievements of American swimmer, Michael Phelps. He's on the mark to scoop 8 Olympic gold medals -- he's already scored 6! This guy is no typical water baby...he's a force unto himself! What makes a champion? Seems everyone and their brother is attempting to figure this puzzle out. This week a very important piece of the mystery was revealed -- the Michael Phelps breakfast, lunch *and* dinner of champions! Turns out, the champ noshes on around 12,000 calories *a day*!! Yowza!! An average male of his size would chow down on only one-sixth of that amount! You've missed an opportunity to post half naked pictures here, LTG. The man has a smokin' body as I found out last night!! wow I feel a little sick just reading about that much food.